Synthetic peptide: GTFPGNYVKPLYL, corresponding to C terminal amino acids 804-816 of Human SORBS1. GenBank Accession Number – NP_006425; NP_056200. LocusLink ID - 10580 (human); 20411 (mouse). Gene Ontology terms - cytoskeletal protein binding; actin binding; cell-matrix adhesion; zonula adherens; cell-cell adherens junction. Our Abpromise guarantee covers the use of ab4551 in the following tested applications. WB Use at an assay dependent dilution. 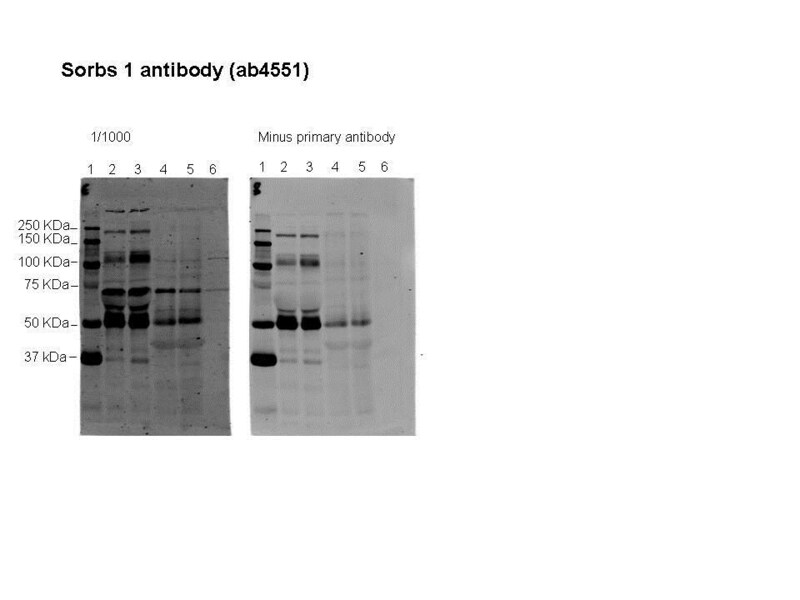 Can be blocked with Human SORBS1 peptide (ab18388). No signal obtained yet but low background observed in human heart and 293 lysates at up to 2 µg/ml. ab4551 was tested in in human plasma, human white blood cells and HEK293 cells. Samples were run for 1h at 200 V using the Fisherbrand vertical complete gel unit, and transferred onto nitrocellulose 0.45um (1h, 100V, 4 C) using the Bio-rad Trans blot cell with plate electrodes. Membranes were blocked for 1 h at RT, then incubated overnight in primary antibody (1/200, 1/1000, 1/5000 or minus primary antibody) at 4 degrees C, with shaking. Following washing, membranes were incubated in secondary antibody (1/5000, Alexa-Fluor680 donkey anti-goat IgG, H+L) for 1 h at RT. Antibody binding was detected using LI-COR Bioscience's Odyssey Infrared Imaging system (intensity 5). The molecular weight of sorbs 1 was calculated using 'Compute pI/MW'from ExPASy tools based on the amino acid sequence according to NP_006425. The band indicated is approximately this predicted molecular weight, and is not present in the minus primary image, scanned at the same intensity. ab4551 (2.5 µg/ml) staining SORBS1 in Human Skeletal Muscle by IHC-P. Steamed antigen retrieval in citrate buffer pH6, AP-staining. This image shows spotty staining on muscle fibres in longitudinal section. Publishing research using ab4551? Please let us know so that we can cite the reference in this datasheet.